Glass Cylinder Vases, 9 in. [MUSIC PLAYING] Get a big bang for your buck with nine-inch glass cylinder vases for large flower arrangements, plastic tabletop decor, crafting and embellishing, or centerpieces for special events. A great choice for florists, event coordinators, gift shops, and small businesses alike, the contemporary design is functional for a variety of settings and displays. A happy customer reviewer said, "I bought vases for a large event of 200 people. I had 26 tables to decorate. And these vases were my go-to for a pretty tablescape. They are very versatile and can be used in many ways." Consider pairing the nine-inch vase with other vases, a variety of glass candle holders, and tea light candles for a stunning tabletop display. 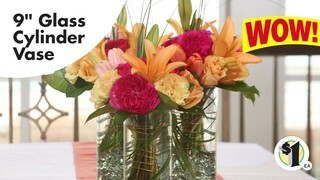 Or fill the vase with a colorful selection of flowers for a can't-miss bridal or special event arrangement. Available for purchase in bulk, this sturdy vase is sure to fit any budget. Shipped free to your local Dollar Tree store. Place your order today. Case of Cylinder Yellow Translucent Glass Bud Vases, 9"..